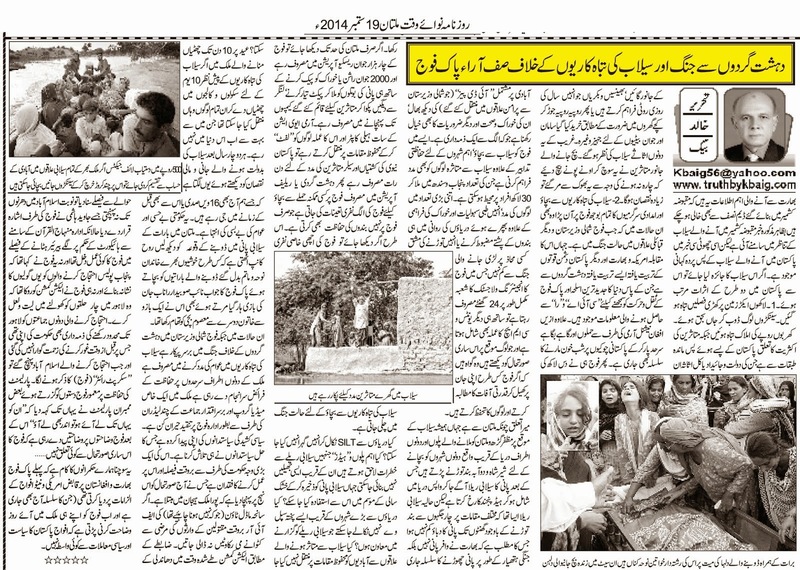 Truth by Kbaig: Pakistan Army Facing War Against Terrorists and Destruction of Floods!!! Pakistan Army Facing War Against Terrorists and Destruction of Floods!!! Important reports from India are that water level in dams at Indian Held Kashmir had dropped to more than half of their capacity; apparently this report was leaked out in the scenario of the floods in Indian Held Kashmir but in fact this report tells the story of the devastating floods in Pakistan. If we carefully examine these floods; it has effected Pakistan in two ways; 1) crops over the thousands of the acres were destroyed, hundreds of people lost their lives. 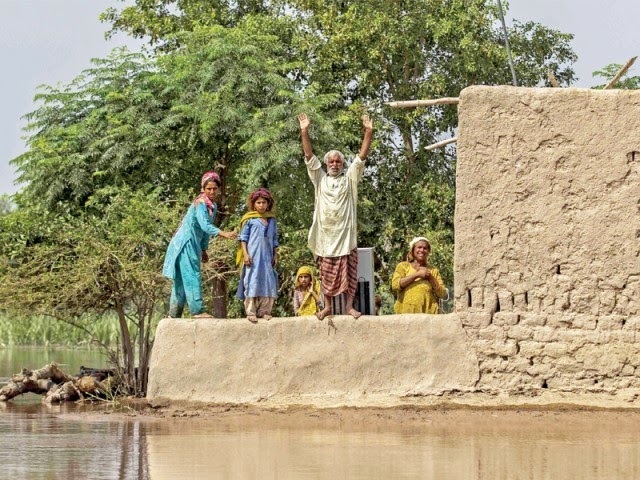 Property of billions was destroyed, while, majority of flood effected people belong to that chunk of society who are already living at or below poverty line; whose total assets are their cattle, mud houses built from life savings and household items bought from savings or items bought for dowry of their daughters. All these assets of these poor people were wiped out by the floods. 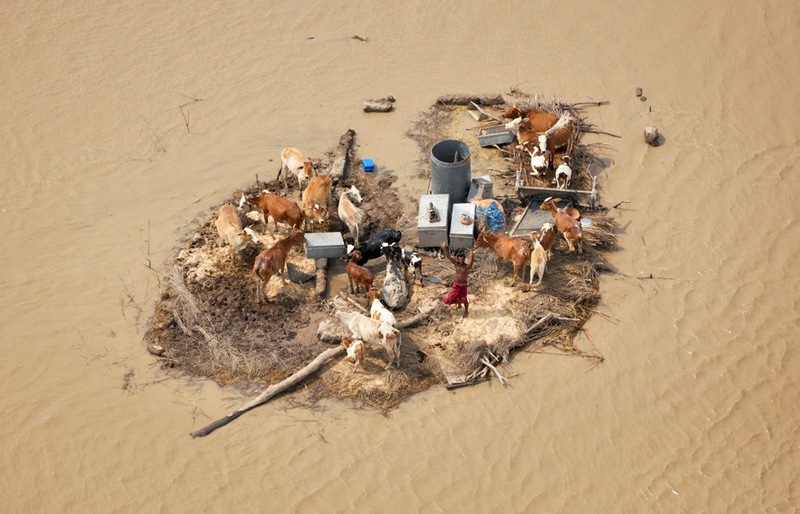 Cattles which were saved from floods were sold by flood affected people at low prices in order to avoid further loss lest cattle may die due to non availability of fodder. Second problem Pakistan had to face due to these floods was extra burden of rescue and rehabilitation of flood affected people over Pakistan army already engaged in war against terrorism in North Waziristan. In tribal areas Pakistan army is facing terrorists funded and trained by USA, India and other anti-Pakistan powers; these terrorists armed with modern weapons and latest information about movement of Pakistani troops from CIA and RAW. Moreover, unprovoked shelling and attacks over Pakistani chek posts by Afghan National army has also become a routine. In addition to this, it is the army who is responsible to look after one million Internally Displaced Persons as the result of Operation in North Waziristan. Army is also responsible to safeguard big cities from floods, rescue people in flooded areas, provide relief goods, provide medicines and food; all this is not less than war at any front against the enemy. In this water war engineering and logistic department of Pak army is busy day n night, along with other units, CMH staff is also busy, the persons who witness all this process can tell you better that how soldiers play on their lives to save their countrymen in natural calamities as well as attacks by enemy. As I belong to Multan, where during every high level flood, roads linking Multan and Muzaffargarh and Sher Shah and Doaba flood dyke are to be blown up in order to save Multan and Muzaffargarh after which the flood water once again joins the river towards Head Panjnad. But this years flood water was such that flood dykes had to be broken from four points after which water pressure decreased after few hours; this is a clear indication that India had not released extra water but used water as a weapon against Pakistan. 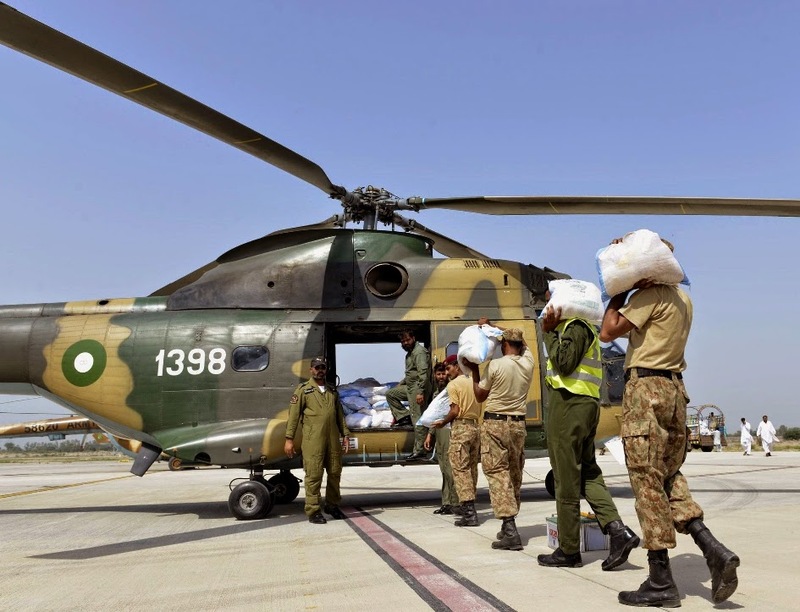 If we look only at the Multan region, more than 4000 soldiers were responsible for rescue work while more than 20000 soldiers kept busy in packing relief packets, getting food cooked and distribution of food in the relief camps. Seven helicopters and staff of Army aviation along with boats and sailors of Pakistan navy rescued people from the flood waters to safe places. Moreover, extra troops are deployed for protection of soldiers busy in relief work and flood dykes. In this way large number of troops get engaged just like they are in war due to floods. Is not this possible to increase depth of rivers by removing the silt? Is not it possible to construct lakes near the important bridges and headworks that have threat from floods to store extra flood water and utilize it during draught. Cannot such concrete spill ways be constructed that can support flow of flood water? Cannot we shift population from flood affected areas to schools after declaring holidays in schools while during Eid schools are closed for ten days? Keeping in view the devastation of floods every 2-4 years it seems we are still living in the 16th century; this is extreme of the political government’s apathy and powerlessness of the public. Just consider the tragic incident of drowning of a wedding procession; how the happiness of two families was converted into tragedy. 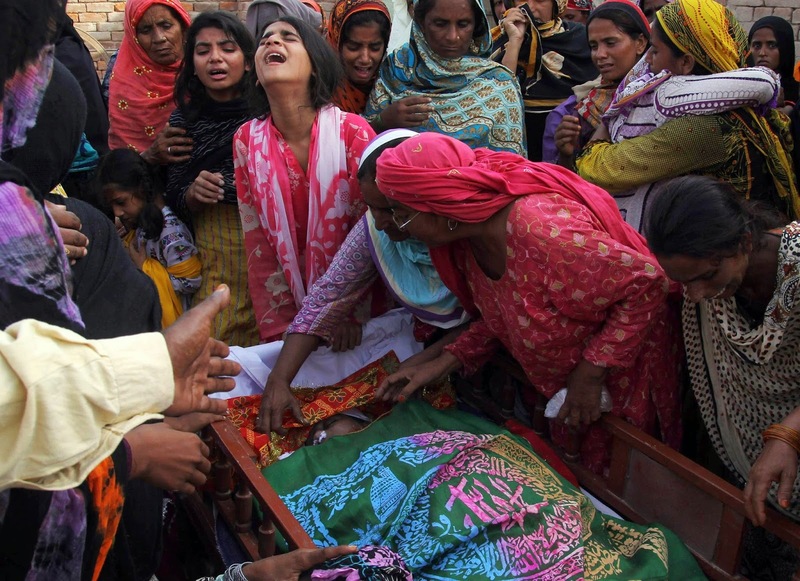 A Naib Subedar of Pak army lost his life while evacuating the drowning participants of the wedding ceremony; he embraced martyrdom in such a way that he was holding a woman in his one hand while an innocent girl in his other hand. In such a situation when Pak army is at war against foreign funded terrorists in tribal areas, water war launched by India and busy in protection of borders from the both sides; a specific media group and few leaders of ruling party are criticizing Pakistan army. Current political crisis is creation of politicians and it is politicians who have to find the solution. One of the causes of current political crises is sluggish decision making of current govt. which has forced whole country into political chaos. If no hurdles had been created in registration of FIR over murders in Model Town Lahore against the accused as per the will of legal heirs of deceased, election commission had taken steps in times as per its rules over rigging elections than situation would not have deteriorated to protest demonstrations and sit-ins in Islamabad. Javaid Hashmi blames it over army. Army had no role in removal of the barriers installed in front of Minhaj-ul-Quran that were fixed there over the orders of the Lahore High Court, army had not asked provincial govt. or Police to target unarmed protestors with live bullets, army had not stopped Election Commission from holding investigations over rigging in 4 constitutes in Lahore. Limiting protestors to Lahore was also responsibility of political govt. however, when protestors reached Islamabad, they started blaming Pak army as “Script Writer”. Few politicians while going to the Parliament taunted troops deployed on security of Parliament to bring protestors within the Parliament as they (troops) had brought them into Islamabad. After this army was forced to give explanations after explanations.